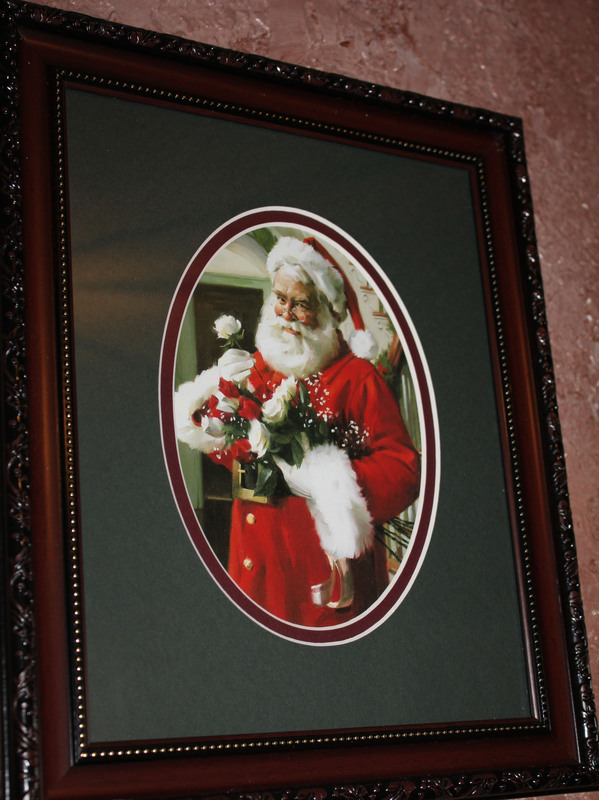 One easy way to deck your walls, or halls, is to hang up some Christmas artwork. Not everyone can afford to run right out and buy some beautiful piece of original creativity, but there are some really inexpensive things you can do. This fun little piece of art is actually a framed Christmas card. I got the mat at Wally-world along with the frame. I think the whole thing probably cost me less than $8. And I love it. Who is Santa giving those flowers to? What is that jolly old elf up to? 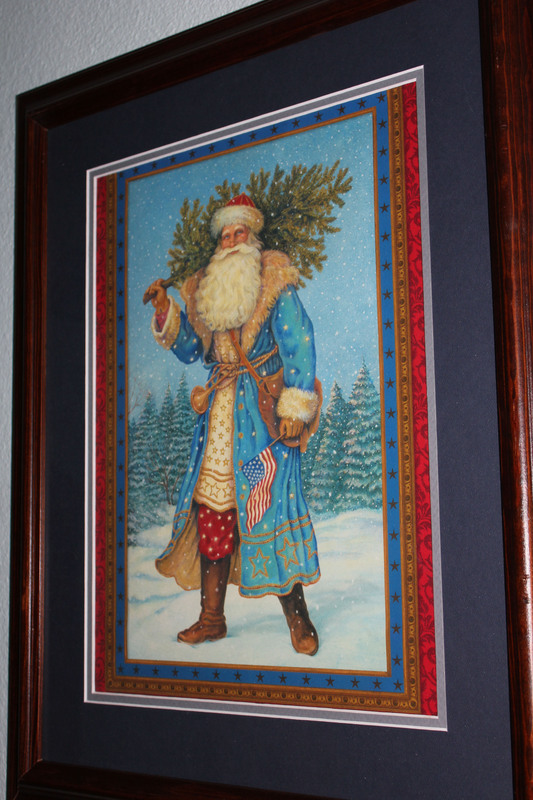 This patriotic Santa print is one of my favorites. It is bold and striking and adds a wonderful pop of color to my dining room wall. The artwork was actually a gift bag I found at a Hallmark store a few years ago. I carefully cut out the front panel that was bedecked with sparkles, put it behind a pre-cut mat (again from Wal-Mart) and framed it. Probably looking at about a $12 investment for this piece of artwork. Captain Cavedweller found this at Costco one year for next to nothing. 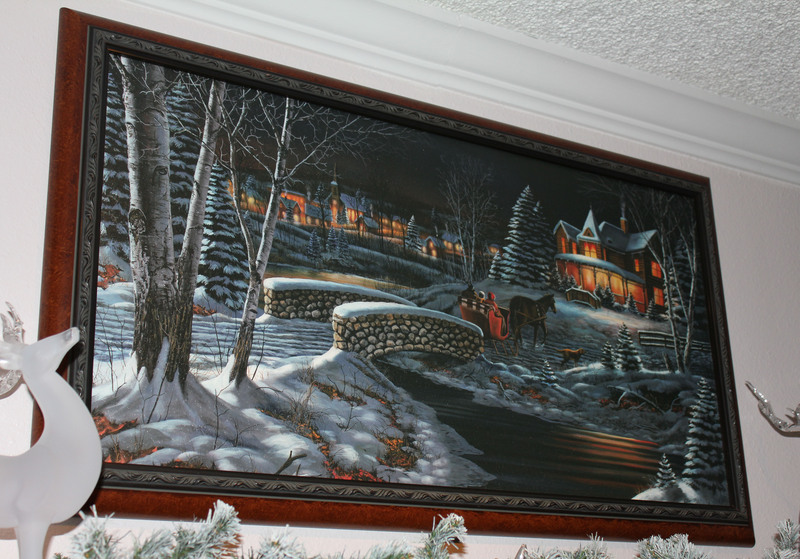 I love the scene and it looks perfect above our fireplace. As you begin to deck your halls, look at inexpensive ways to bring some magic to your home.